Which team truly is the best? But the Utes are in the zone! COMMENTARY — Long gone are the days when Utah was the Rodney Dangerfield of college football not getting any respect. Instead, Ute Nation is joyfully joining in the chorus made famous by Aretha Franklin, R-E-S-P-E-C-T! 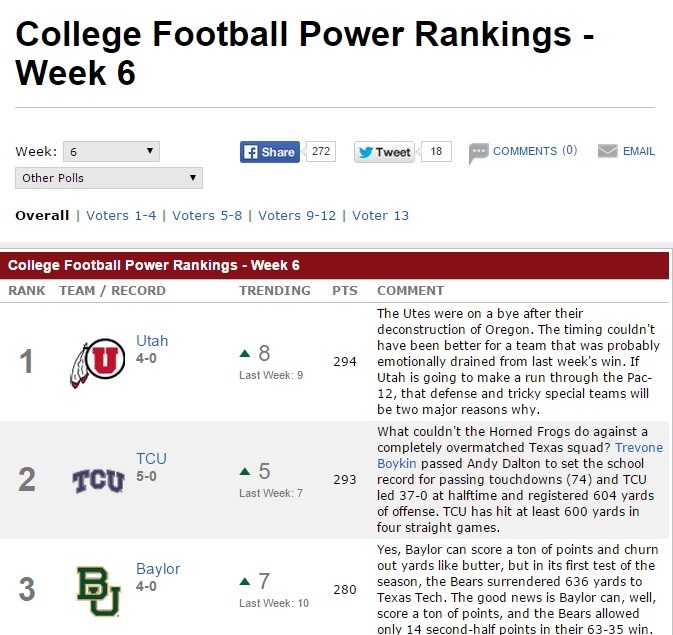 The polls are out, and as expected Utah has moved up in the rankings during its bye week. The Utes currently check in at No. 5 in the AP Poll, No. 7 in the Coaches Poll, and are receiving first place votes in both polls. Additionally, Utah is sitting pretty at No. 1 in ESPN’s Power Rankings. The respect afforded the Utes by the voters is evident when looking at the rest of the field. Currently, 16 of the teams ranked in the Top 25 are undefeated, yet only four of those teams are ranked ahead of Utah. The Utes have never been that highly-esteemed nationally and it is nice to see Utah finally getting some recognition for being the fine program that it is. Seriously, how great is it to be a Ute fan right now? I dare say it is Utahlicious! Forget nirvana, I’m living in Ute-opia. I know, I know, it is still early in the season, and a lot can happen between now and the end of the season (just ask Mississippi State). Nevertheless, I still can’t help reveling in the success enjoyed by Utah thus far and wondering what could happen, might happen, if only I could wish it and make it happen, over the remainder of the season. Mississippi State is the cautionary tale that Ute Nation needs to keep in mind. In 2014, the Bulldogs were picked to finish fifth in the SEC West behind perennial powerhouses Alabama, Auburn, LSU and Ole Miss. Sound familiar? The Bulldogs did not even appear in the initial polls, and made their first appearance in Week 5, debuting at No. 14 with a 4-0 record. By Week 8, they had risen to the top spot in both polls. However, a November loss to Alabama brought them back to earth. A second November loss to Ole Miss dropped them to double-digit rankings. Ultimately, the team that was ranked No. 1 in the first ever College Football Playoff Rankings, which decides which four teams get to play for the national championship, lost three of its last four games, including a loss to Georgia Tech in the Orange Bowl. Certainly, the glare of the national spotlight can be intimidating, something the 2015 Utes are finding out firsthand. “If you want to be a good team you’ve got to handle the success … and attention that’s being placed on your program, and that’s part of the deal,” Whittingham said. “You have to be able to block out the noise … and continue to do the things that got you where you’re at. Now, if you had polled Utah fans prior to the season and asked them if they would be satisfied if the Utes went 10-3 and played in the Orange Bowl on Dec. 31, I’m betting many, and perhaps most, fans would have gladly accepted such a result. However, it is a lot different when your team is in the thick of the race and has a chance to exceed your expectations. Utah is just getting into the real meat of its Pac-12 schedule, a fact which is not lost on head coach Kyle Whittingham. After the big win over Oregon two weeks ago, Whittingham was already focused on the task at hand that still lay before the Utes. “We have to get ready for the gauntlet and the grind that is the Pac-12,” he said. He reiterated the point at Monday’s press conference. The Pac-12 is a grind, with only two undefeated teams left—Utah and Cal. 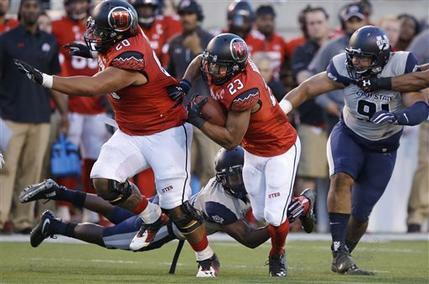 Coincidentally, the Utes host the Golden Bears on Saturday in a matchup receiving plenty of national attention. ESPN’s College GameDay will pay a visit to Salt Lake City this weekend. Whoever wins the showdown between Utah and Cal will be the sole undefeated team left in the Pac-12 and the current favorite to represent the Pac-12 in the four-team playoff at the end of the season. I think any undefeated team from the Pac-12 is a lock to make the four-team playoff and I thinks odds are in favor of a one-loss Pac-12 champion still making the 4-team playoff. My wife and two daughters have already made it perfectly clear to me that if the Utes end up playing in the Rose Bowl, then they plan on spending New Year’s Day in Disneyland while my son and I go to the game (which for me, would truly be the happiest place on earth, notwithstanding Disney’s claims to the contrary). But alas, I am getting ahead of myself. There is still a lot of football to be played before the post-season bowls and playoffs begin. There is still a lot that can happen. But isn’t that one of the reasons why we are so fascinated by sports? Anything can happen? If the results were already written in stone, there wouldn’t be any point in cheering, or even watching. Here’s hoping that the Utes make the future a great one, including another big win over Cal this weekend in front of a national audience!